Dassyutu Game - Room Escape 17 is another Japanese point and click type escape the room game developed by InfoWEB. 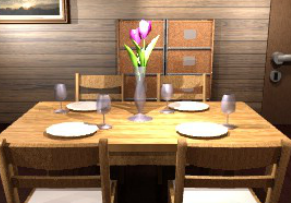 In this game, you try to escape the room by finding items and solving puzzles. Good luck and have fun! for the "direction/arrow" puzzle, more than one clue is needed. keep in mind what mirrors do. hi cate,do you mean bottom drawer arrows ? hi back, kevaus...yes. the visual clue you get for arrows has to be combined with info from something else...i'll spoil it, if you like. Hi Cate and keavus....where to use mirror? kevaus, the clue you find will give the order...it's not straight ahead 1234.
hey vanja, roam around upstairs and look "out of reach". My only problem was with the clock, on night table. Use battery there. This was very logical and quite fun! Great job! Out with 9 coins. nice! use crowbar on floor between shelf and coat rack. It gives you color ink for printer. use scissors on envelope when you get it. Nice, but only 9 coins. There's no coin for me in the mirror-puzzle-drawer. Btw, I can't fill in the letters from right to left on that one, but only from left to right. Tenth coin was drawer opened from mirror clue - it opens two ways: letters as shown on mirror and reversed where the p becomes a q. If opened with the q way you get the key AND a coin. Nafanja, I had the same problem the second time I played (I always play twice!). Once you open the window, the alarm goes off - use that number. If you opened window before putting battery in, alarm will sound as soon as battery is in.